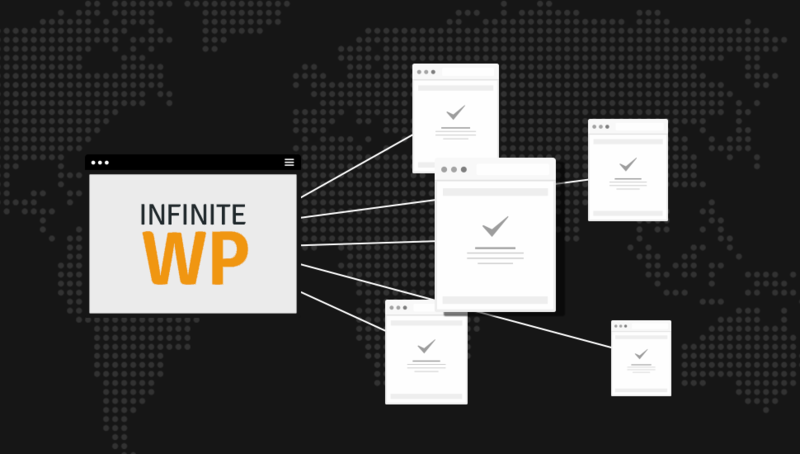 As someone that manages and maintains a large number of WordPress sites, InfiniteWP has become an invaluable tool for me, and one that I couldn’t function without. One of the services I offer that I am most proud of is my WordPress management and security package – in fact I consider it so essential a service that I won’t host a website on my servers without it. InfiniteWP allows me to monitor the Wordpress installations I am responsible for to see when they need updates, and to provide various services to each one when they need it. WordPress is beautiful software, but it really depends on regular maintenance to keep it safe and secure, and InfiniteWP is foremost among the tools I use to do this. Using InfiniteWP I can be kept up-to-date with essential WordPress updates and plugin updates. Both of these are really important in order to keep a site secure, because out of date code is an easy way in for a hacker. I update all my sites daily, or whenever they need it, and with so many sites all requiring updates this would be an impossibly time consuming task without being able to do everything from InfiniteWP’s control panel. When a plugin has an available update I am notified immediately, and by logging in to InfiniteWP I can then deploy the update to every site that uses it. This is especially important for security plugins such as Wordfence and Bulletproof security, because they are frequently updated to include answers to the latest security threats. Unless a WordPress install is secured by the latest versions of plugins like these, and unless you can be certain that there are no vulnerable plugins or old software versions, you cannot guarantee the safety of the site. Another advantage of the InfiniteWP is that it is not necessary to log in to each site using the admin passwords, this is a layer of protection that I appreciate. If you are a webmaster with access to your client’s websites then you really must be using extremely secure passwords anyway, but I am frequently amazed by the passwords some people choose. Insecure passwords – particularly on Admin accounts – are a key reason why WordPress sites will get hacked, so what better way to be safe than to never use a password at all? Safe, and very convenient. There are plenty of ways to backup a WordPress installation, but the way I prefer is using InfiniteWP to backup to the cloud (using the Schedule Backups and Cloud Backups addons). A lot of web servers will backup locally – to the same server that the website is stored on, which is fine so long as nothing happens to the server hardware. Remote backups are available from services like Vaultpress but are often overpriced, and I prefer to monitor everything from one place. InfiniteWP’s backups provide an extra level of redundancy on top of automated local backups, and with databases and files stored securely on Google Drive you can be sure they are safe from danger. You can never have enough redundancy! I have restored countless WordPress installations that have been hacked,suffered from server failure or fallen foul to some malicious code or activity, and it’s not a fun task! Not only do you risk losing content if your backups are out of date, but you risk losing visitors or pagerank too. In some cases a website can become blacklisted causing your emails to be marked as spam, or visitors to be warned away from your site even after it has been cleaned. In short, it’s best to never have these problems, and with a combination of InfiniteWP and correctly configured plugins you can be safe. I’ve mentioned Wordfence before, to my mind it is an essential addon, and it is integrated with InfiniteWP so that scans can be run regularly and problems spotted sooner. The Malware Scanner is another great tool that serves a similar purpose, using Sucuri to analyse sites – regular scans will detect any issues. Between these two services, no infection or problem can go undetected. There are a number of reasons a site can go offline – sometimes it is hardware related, sometimes it is due to malicious activity and sometimes it is due to user error (such as forgetting to renew your URL!). My server is cloud based with double redundancy at every level, hardware failure should be impossible – but it never hurts to be prepared. In the event of a problem that takes a website offline it can be hours before anyone notices, particularly if your emails have failed as well – perhaps the first sign you know something is wrong is when you start getting phone calls! Clearly this is not acceptable, so all the sites I am responsible for are monitored by the Uptime Monitor addon which is able to contact me automatically on my phone (day or night!) in the event of a problem so I’m always the first person to know if a site is offline. Thankfully there are rarely any problems! Well, convenience is the main reason to use InfiniteWP. It offers freedom from the essential chores of website maintenance that would otherwise be overwhelming. Without being able to conveniently monitor every site from one location it would not be practical to perform updates so frequently, or to scan so thoroughly. WordPress security is something I feel strongly about – it’s an area that can be neglected because it is inconvenient or too time consuming, but it is something that really needs someone capable looking after it. Without InfiniteWP I wouldn’t be able to offer the security and maintenance services that I do, and I wouldn’t feel comfortable hosting WordPress sites without those services. In short, it’s an essential tool for a responsible webmaster. How InfiniteWP can be used to monitor Wordpress installations, and keep them safe and up-to-date. thanks for the article. My main interest (and concern) is the backups/restores. Like you I prefer backup to the cloud, plus my host doesn’t like backup files clogging up their servers. I’ve read complaints online that sometimes when IWP says its completed a backup it actually hasn’t. Have you noticed this happening to you? Another big concern of mine is the ability to restore a site quickly if need be. I’ve only done this manually in the past and its a hair raising experience. have you done this yet with IWP? if so, what was your experience? also, I’ve read that after performing a restore IWP deletes the backup file. do you know if that’s true or not? it sounds silly to me. I haven’t noticed it reporting that is has completed when really it hasn’t, in fact I think it’s sometimes the opposite – it says a site has failed but there is a complete backup zip in my cloud storage anyway. I’ve never needed to restore a site through IWP but as far as I am aware it’s a one-click process. I’m afraid I don’t know the answer to your last question, but the guys at IWP will be able to tell you, they are pretty good with support tickets.